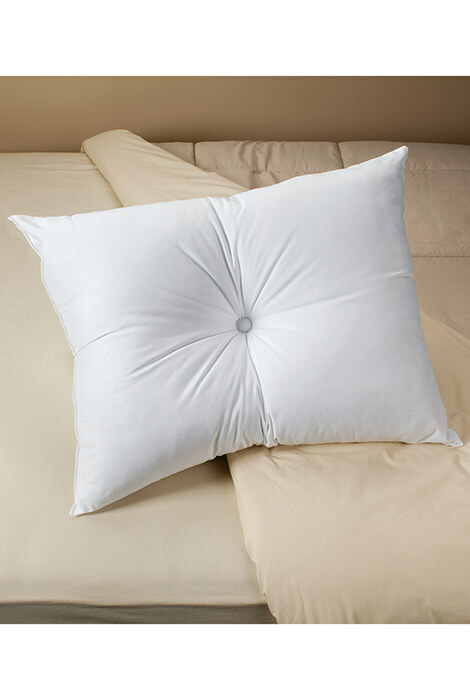 Sleepy Hollow Anti-Stress Cooling Pillow combines therapeutic positioning with a cooling fabric cover. Its dimpled center keeps your head, neck and spine properly aligned to help alleviate pain, stiffness, and headaches. Advanced heat-transfer technology helps the contour pillow stay cool even when you get hot, so you can sleep in comfort all night long without overheating, tossing, turning or flipping your pillow. Standard size shaped pillow. 100% polyester. Spot clean. My sister and I have literally spent hundreds of dollars buying pillows trying to find one in which we don't hurt when we wake up in the morning. Either our shoulders or neck hurt or constantly wake during the night rearranging the pillow. FINALLY, we both found that this cooling anti-stress pillow allows a very comfortable restful sleep all night and wake painless and refreshed! Thank you, thank you, thank you for having offered such a good product! I used to have bad headaches due to a fall earlier in my life! I tried the ergonomic pillows and they helped, but I still would have a headache often. With this pillow, I am so much cooler and more comfortable and I haven't had a headache since I started using it!! Thank you God and Miles Kimball! !